I don't know where the school year has gone. Wasn't it just beginning.... and now it's ending. Time just seems to be slipping away. 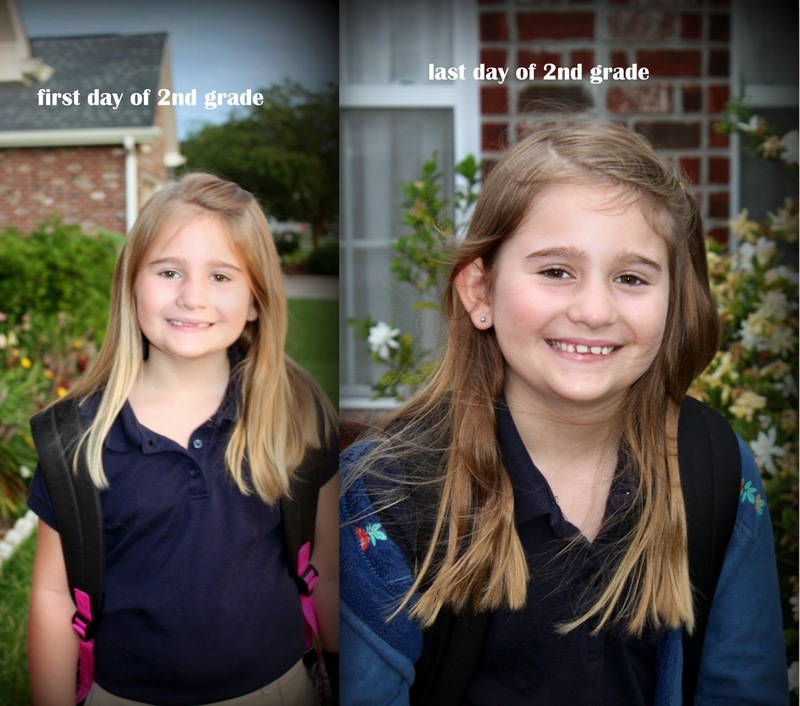 My girls are growing up much too fast. 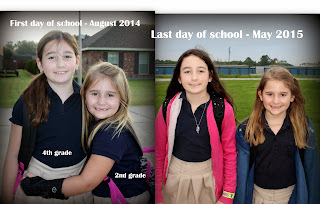 This was Valerie's last year as an elementary student. 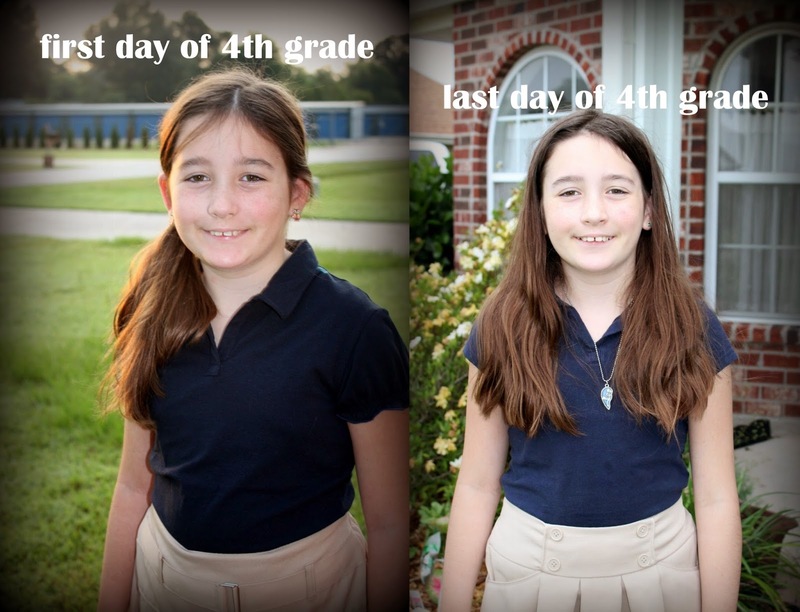 She's off to fifth grade, middle school!! She wants to be in the band and on the dance team.... no more little girl stuff. Veronica is heading to third grade. I don't know how my baby is going to third grade already?! Both girls finished with flying colors! Straight As all year long. Valerie had a few struggles with some of the new common core stuff, but she pulled through. Veronica has surprised us all with her straight As on just about every single test she took. I think she made one "B" all year long. I have some smart kids!! On the downside, awards ceremonies were held this past week. I knew Veronica was getting an award for being on the principal's list all year. The math objectives deadline was last week, and she worked SO hard to finish. She crammed in the last of the quizzes to master all 90 objectives in second grade math for an award. She did it, she told me! Roni loves math, and she was so proud of herself for earning an award. At 4am on awards day, she crawled in my bed telling me she had the best dream: she had gotten a giant trophy for the math award, so big it was delivered to our house. Funny! On awards day, Veronica got the principal's award first, so she was standing on stage, all bubbly and happy. Her teacher gave out the math awards, and we waited with anticipation for Veronica's name to be called too. It never was. Once my sweet girl realized it, she looked at me sitting in the front row and her face fell. She fought back the tears through the rest of the ceremony. I kept mouthing "it's ok!" I thought she was mistaken about the award and just hadn't finished the work. At home, Veronica insisted she had completed everything and she should have gotten an award. Veronica is right more often than not, so I sent an email to her teacher. Her teacher FORGOT to read her name. She was on the list. She was skipped Her teacher apologized and said she would tell the office and try to get her a trophy. I know it's not the same as getting a trophy on stage, but at least she'd get it. BUT.... Somehow, the school is out of trophies, so there is no trophy for Veronica. 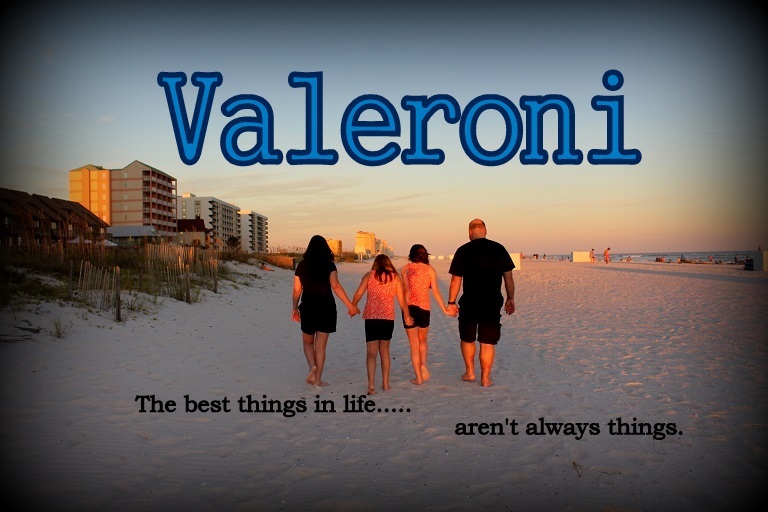 Her teacher also told a fib and told Veronica she called her name, but Roni didn't hear it. Um NO! We have it on video. Veronica doesn't seem too bothered any more, but it sure does bother me. I know it's just a silly trophy. My kid worked so hard to finish all of those math lessons and take all those quizzes to be finished on time and was so proud to be recognized. 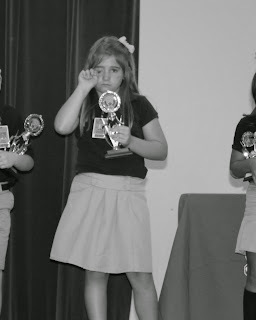 I know I can't depend on the school to magically find her a trophy, so my plan is to buy her one. A big one. When I pick her up from summer camp in a few weeks, I'll tell her the school called and they had a new trophy for her. The next day was Valerie's award ceremony. She was the ONLY one in her class to get a trophy for being on the honor roll every 9 weeks. Val also got a medal for being second in her class for advanced reading!! Mother's Day was quiet!! Clint had flowers delivered and both girls made a few cards at school. We had talked about going out for brunch, but nothing sounded appealing. Over priced buffets with mostly food that the kids wouldn't eat and crowds of people just didn't interest me at all. I knew it would be an hour or two hour wait for a table at almost every restaurant in town. Instead we stayed home and Clint grilled some awesome steaks. We just stayed home all day and didn't do much of anything! My appointment with the new endocrinologist in the area was last Tuesday. I'd been waiting four months to see this guy and had high hopes that he was a young, new doctor and would be on top of new studies. Nope, how wrong I was. He didn't even read my chart. I had a stack of paperwork to complete prior to my appointment, and you all know I put "total thyroidectomy" and "not feeling well" on there. I commented on something comparing now to before my surgery, and he asked, "what kind of surgery did you have?" Um, the one that is the main reason I am here? And how can you not see the huge scar across my neck? We talked about adding T3 - Cytomel. The nurse drew blood for labs and since I was a new patient who felt awful, I thought he would run a full thyroid panel. Nope. He only ran TSH. That number alone means nothing. They called me with the results and said my TSH was much too low to add Cytomel. Ok, that is a T3 medicine to boost low T3, but you didn't even check my T3 so how do you know if I do or don't need it?? How can you deny me T3, when you didn't even test my T3??? He wanted me to switch to a much lower dose of Synthroid to raise my TSH then re-test in 3 months to then see about adding the Cytomel. Basically, take less medicine for months so I could feel worse before adding a medicine that could possibly make me feel better. I put a call into my regular endo; the one who has treated me for the last ten years before this surgery. His office is a hot mess, but he knows his stuff. He knows me. By some miracle, they worked me in for the next day. 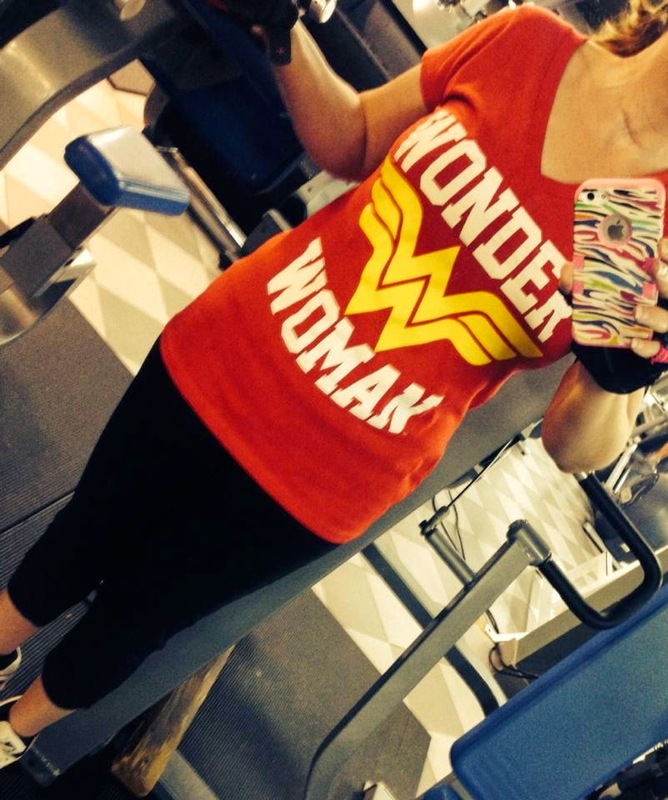 He lowered me to 125 Synthroid to 'make room' and added 5mcg of Cytomel twice a day. That is much more doable!